Shoe Storage & Boot Shapers With A Difference! If you love your shoes you may be looking for some shoe storage boxes that are a bit special. Something you can make a feature of, and there’s no better place to look than these unique Zebra Print Shoe Storage products on the Caraselle site. 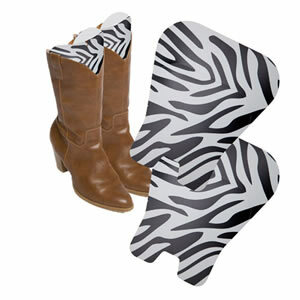 Exclusive to Caraselle, these Zebra Print Stackable Storage Boxes and Boot Shapers give some wow to your shoe storage! With matching Zebra Print Tissue Paper to protect your footwear, they do the job with style! They really do create lots of interest and don’t limit where you can store them – put them on shelves in your wardrobe to show them off, or even in your hallway where you’ll most need to access them – you won’t want to be hiding them away! Like all products in Caraselle’s Shoe/Boot Storage Range, they are exclusive to Caraselle and made in the UK. The Shoe/Boot Box Range are larger & stronger than many others and that’s because they have been made to Caraselle’s high specifications. Why not add to your Zebra range with some wild Zebra Print Deluxe Tissue Paper to protect your shoes and boots in the boxes. Of course the tissue paper is also great for other storage and ideal for gift wrap.